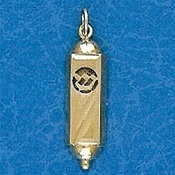 14K yellow gold mezuzah pendant with a "shin". Traditional design with diamond-cut etchings on the front. Scroll not included. Measures approximately 1 inches tall. Made in Israel.